Very early yesterday morning, I drove out to Limantour to take some pictures. Limantour is always fantastic, especially when it’s deserted – which it usually is on a weekday at sunrise. 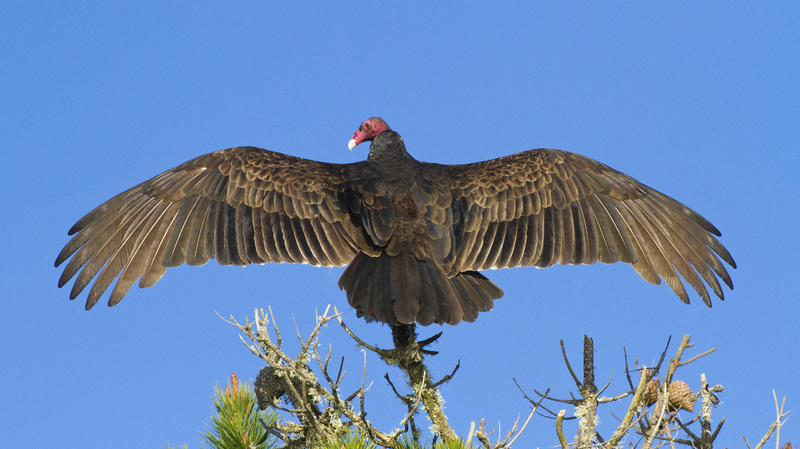 Turkey Vultures are a common sight around here, and almost everywhere in the western hemisphere. Their range extends from southern Canada to Cape Horn. They’re scavengers, which means they feed almost exclusively on dead animals, aka CARRION (but not the kind you take on airplanes to avoid checking baggage). These are very big birds, with a typical wingspan of just under 6 feet. With the burdens of ubiquity, scruffy black plumage, creepy featherless head, and the repelling carrion diet, Turkey Vultures get NO RESPECT. (Fortunately, I’m far too sophisticated and erudite to use an expression like “the Rodney Dangerfield of birds”, a tasteless and banal cliché. Never.) HOWEVER, I hope you take a good look at this bird, because there is a certain NOBILITY in this pose, which looks like an illustration for a detailed study of feather architecture. It was quite hot last night. We opened an upstairs window for some ventilation and found this amazing moth on the window screen. Look closely at the first image; you’ll see a FACE looking straight at you. Eyes, nose, mouth, lower jaw -- I think it looks like a lion. The “ears” are actually the moth’s forward leg pair. 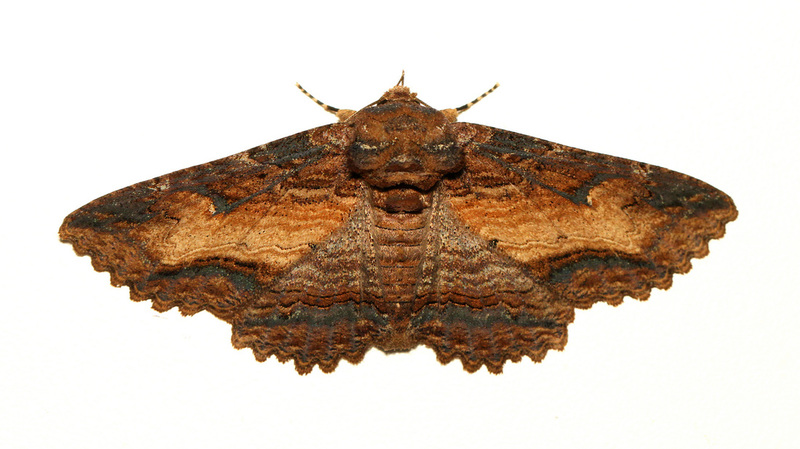 I did a little research… It’s a Lunate Zale moth (Zale lunata). It was quite a cooperative photo subject, posing motionless for 30 minutes as I set up lighting, tripod, and camera. After shooting a few pictures on the window screen, I decided I wanted some pictures on a white background, so I captured the moth and set it down on my desk downstairs. It was facing my desk light – i.e., the wrong way for some of the shots I wanted. In order to get it to turn toward me, I shut off all the lights and shined a flashlight at the moth, which turned quite deliberately and looked directly into the light. The second photo shows a close-up of the individual scales on the wing. 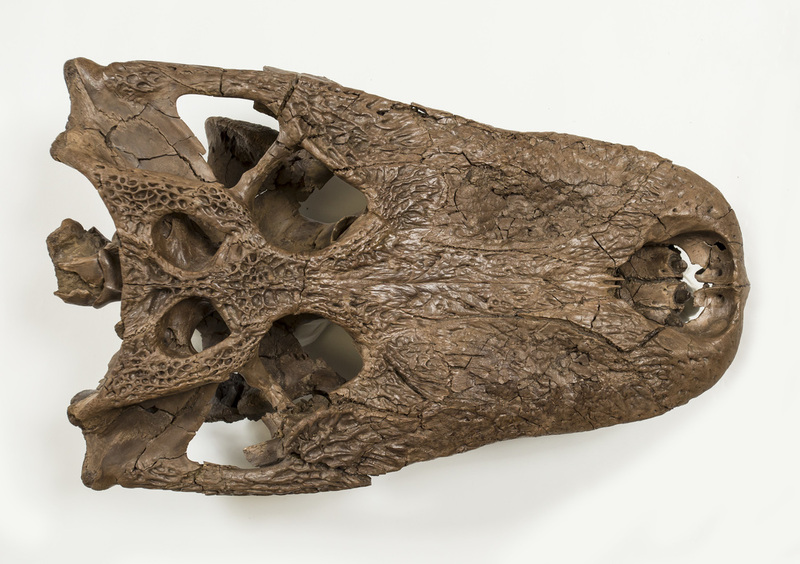 These photos show a spectacular fossil skull of an alligator-like animal called Brachychampsa montana that lived about 70 million years ago (along with rock star dinosaurs like Tyrannosaurus and Triceratops). The nearly complete fossil was excavated in North Dakota in 1986. I pulled this spectacular specimen from the UCMP (University of California Museum of Paleontology) collection to take photos of it for their 2013 calendar. 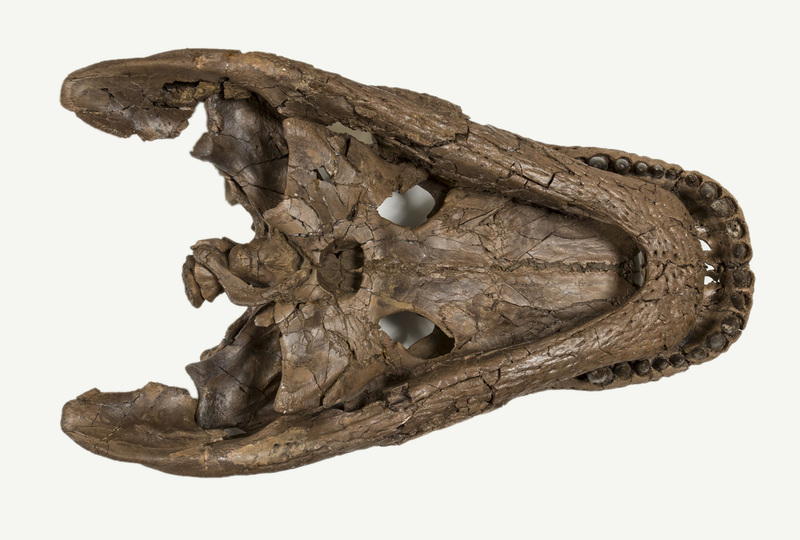 Apparently Brachychampsa were pretty successful creatures in spite of a serious overbite. The species survived for a few million years beyond the extinction of most dinosaurs at the end of the Cretaceous, about 65 million years ago. I found this lizard under a rock near Rifle Camp around 9:30 this morning. It’s a Southern Alligator Lizard. Lizards are quite common on Mt. Tam, but most of the lizards you see running around are Western Fence Lizards. 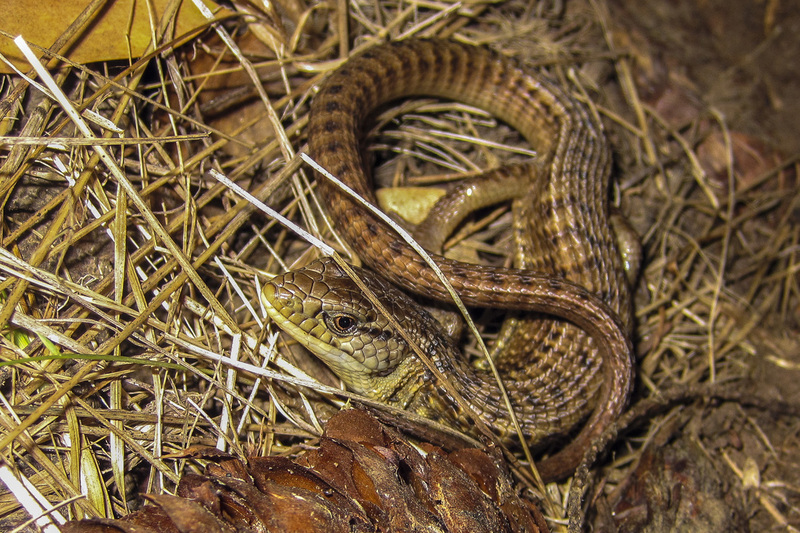 Alligator lizards have very different proportions, with long bodies and very long tails. 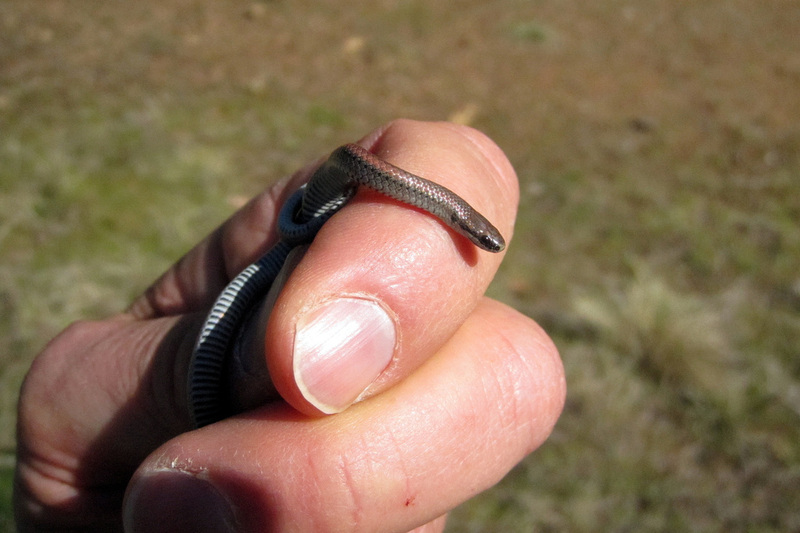 Unlike fence lizards, they often move across the ground in rapid s-shaped undulations – a motion that looks more like a snake. Here’s another cooperative creature that showed up in our back yard and volunteered to be a model for Creature-of-the-Day. 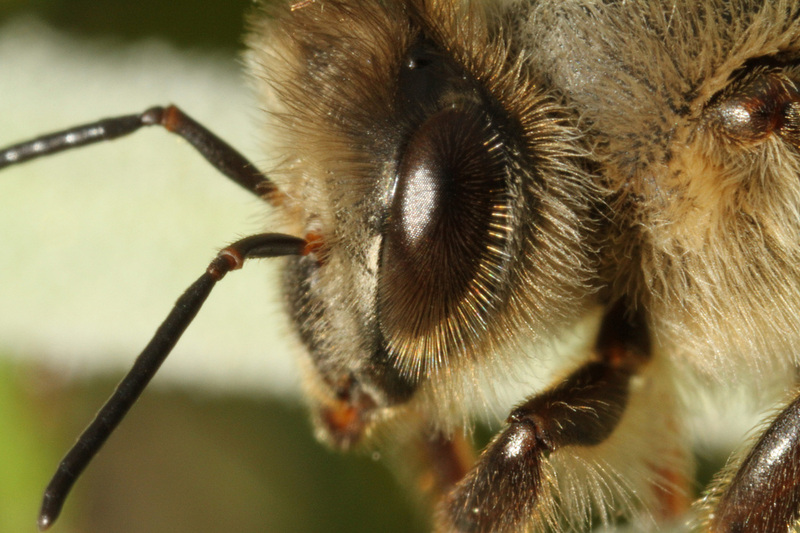 I didn’t realize that honey bees had hairy eyes until I looked at these pictures. 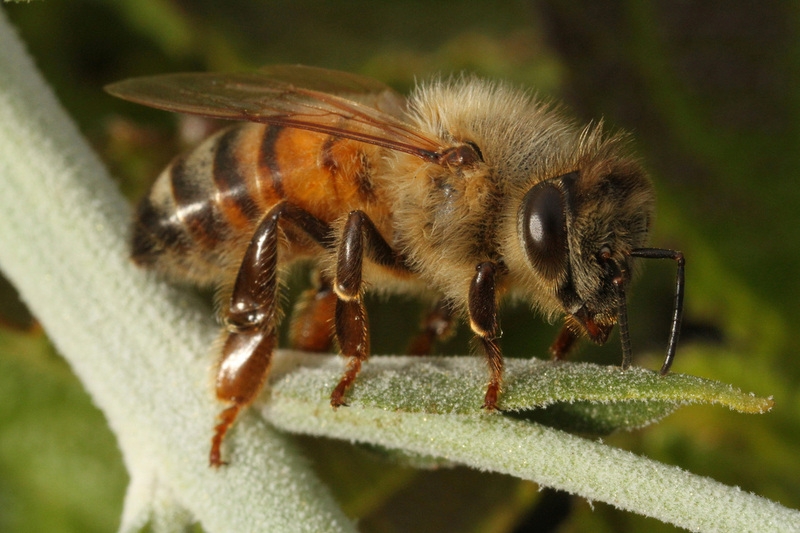 Random bee factoid #1: Honey bees (Apis mellifera) are non-native bees that were brought to California from Europe around 1850. Random bee factoid #2: The bee in these two photos is a worker and all the worker bees are female! I’m not making this up (nor ENDORSING this behavior in any way). And I’m not the kind of person who would try to make some lame joke about all workers being female; that would be so inappropriate. So, the workers are female, BUT SO IS THE QUEEN! There is no such thing as a KING bee! I’m not too sure what bees are trying to say about gender roles. Evolution being what it is, this situation might be very different 100 million years from now. Today’s POP QUIZ goes on your PERMANENT RECORD. Question: Is a “DADDY LONG LEGS” a fly, a spider, or something else? Answer: All of the above. There are three different kinds of creatures that are often called “DADDY LONG LEGS”. One is a fly, one is a spider, and the third is a common arachnid (but not a spider) called a “harvestman”. Although they all have lots of very long skinny legs, they’re easy to differentiate. If it has wings and flies, it’s a crane fly, see photo #1. 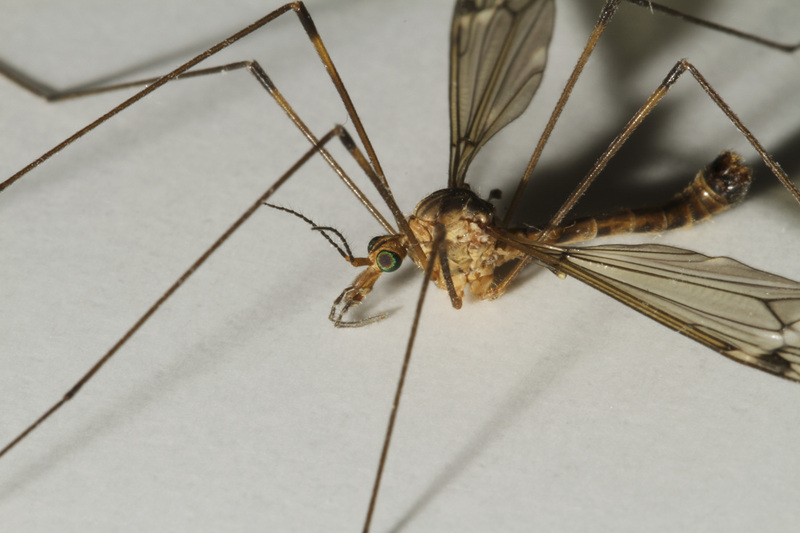 A crane fly is an insect, so it has 6 legs. The legs of the crane fly in the photo are in strange positions, but if you look carefully, you’ll find all 6. There are thousands of species of crane flies distributed all over the world. The largest tropical species is about 4 inches long. That’s a big fly! Good news: They don’t bite people. 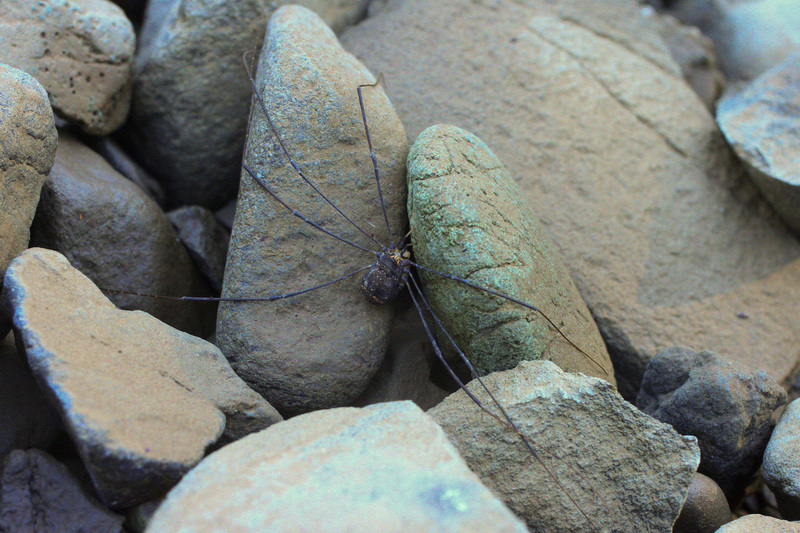 If the body is wingless, has 8 very long legs, and appears to be an oval shape, it’s a harvestman, photo #3. Wait a minute; this guy has 7 legs. The right rear leg is missing. This is a creature that has changed very little for over 400 million years. Although I’m always looking for bugs, snakes, spiders, lizards, and birds when I'm out hiking, amazing creatures often just show up in our back yard. 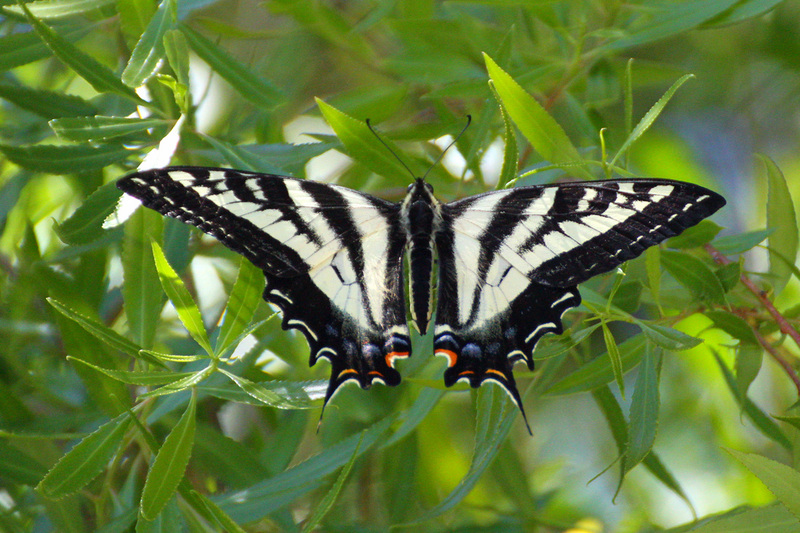 This male Pale Swallowtail has been hanging around for the past few days. During lunch yesterday, I noticed him out the window. I grabbed my camera and went outside. As far as I know, no videos of me chasing this butterfly have been posted to YouTube. That's a missed opportunity. With my face pushed up against the camera with one eye looking through the viewfinder, and the other looking for the rapidly/randomly moving butterfly, I staggered and tripped, trying to get a shot. Fortunately, I didn’t fall off the deck, and I did get a couple of pictures of this very cool butterfly. It’s about 4 inches across. ﻿Iridescence is an amazing optical phenomenon that adds some mystery and uncertainty to the appearance of many hummingbirds (and all kinds of other things like soap bubbles, abalone shells, certain butterflies, many crystals, etc.). One definition of “iridescence” is “the property of certain surfaces that appear to change color as the angle of view or the angle of illumination changes”. These two pictures of a male Anna’s Hummingbird, taken from positions a few feet apart, show how the apparent color of his head changes with a slight variation in illumination – in this case, ﻿from the sun. Today’s photo shows a male Anna’s Hummingbird. But there's more! If you move away from your monitor about a foot or two and look at the out-of-focus background, you’ll see that this is also a photo of a Ford Ranger XLT pickup. WOW! 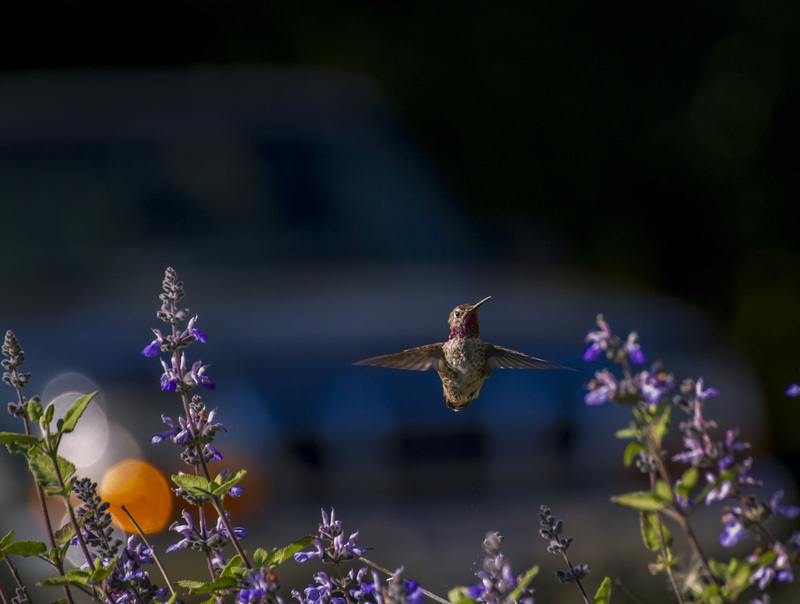 (You just don’t know how challenging it can be to get a Ford pickup and an Anna’s Hummingbird to pose together for a photo.) NOTE: If you can’t see the pickup, you need to put down your iPhone and go home so you can view the picture on a decent monitor. Thank you. 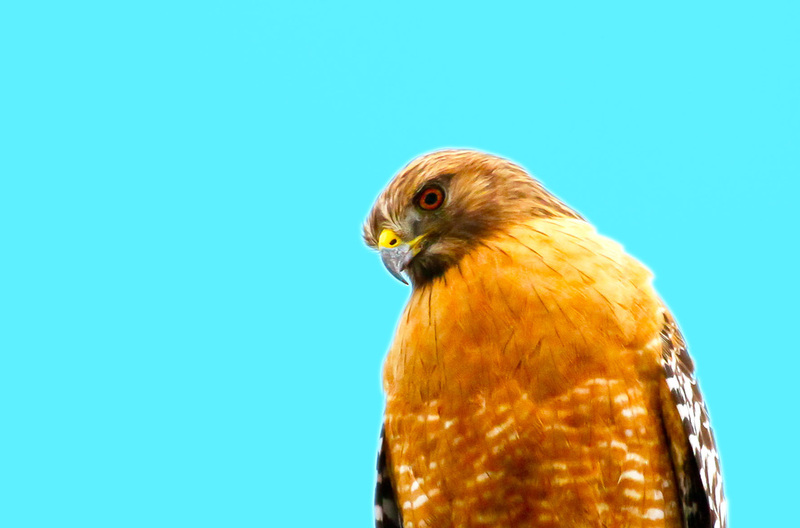 I saw this beautiful red-shouldered hawk from my window this afternoon. At home, my camera is usually nearby, but often with the wrong lens on it for a bird photo. This generous bird gave me about 30 seconds to change the lens and camera settings, walk out onto the deck, and take a picture. This beautiful little snake is about 8 inches long, and the diameter is about half way between a pencil and a strand of spaghetti. Sharp-tailed snakes are not rare, but they are secretive and almost never seen out in the open. I found this one under a grapefruit-sized rock during a bike break today near Rifle Camp. The tail isn’t seen in either picture, but it really does come to a sharp point! The black and white crossbars on the underside are also distinctive, so along with the sharp tail, this snake is very easy to identify. Male mockingbirds can mimic the sound of almost anything, and many have a repertoire of hundreds of songs. They can sing nonstop for long periods, and they can duplicate the sounds of many other birds so well that they often fool experienced naturalists. The females are impressed by these vocal pyrotechnics and select mates accordingly, so males are highly motivated to be creative. Researchers have recorded mockingbirds accurately reproducing the sounds of car alarms, barking dogs, squeaking hinges, many musical instruments, and an amazing variety of other very un-birdlike sounds. POP QUIZ: Everybody knows that the California Quail is the official California STATE BIRD*, right? 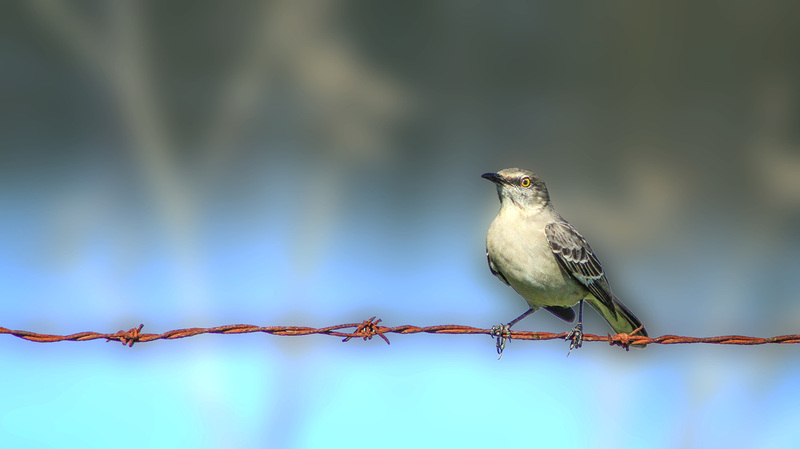 Which state designates the mockingbird as its STATE BIRD? Answer: Florida, Mississippi, Texas, Arkansas, and Tennessee. Wow – popular bird! FLOWER: California Poppy. Remember, April 6 is California Poppy Day. MARINE FISH: Garibaldi. Sorry Garibaldi fans, but the Garibaldi didn’t get to be the “state fish” because we already had a state fish (above), so it’s only the state “marine fish”. Disappointing. ANIMAL: (I think they meant LARGE CARNIVORE.) Grizzly Bear. Its image dominates the state flag. Grizzly bears haven’t lived in California for 90 years; the last one was shot in 1922, but changing the flag to a currently-alive animal is like a shooting at moving target, so to speak. REPTILE: Desert tortoise. I’ll bet you didn’t know that California had an OFFICIAL STATE REPTILE. Who didn’t know that a tortoise is a reptile? GEMSTONE: Benitoite! Benitoite (pronounced "ben-ee-toe-ite") was initially thought to be sapphire, but it wasn’t. OK, good to know. INSECT: California dogface butterfly. It’s a very cool looking creature; look it up. I did. GRASS: COOL. There is an OFFICIAL STATE GRASS! I am NOT making this up! NO, NOT Cannabis, it’s Purple Needlegrass, a beautiful native bunch grass. The breakthrough legislation in 2004 establishing an OFFICIAL STATE GRASS apparently had strong bi-partisan support. This little guy probably looks familiar to many of you who wander around Bay Area woods. But take a closer look, because it might not be what you think it is. It’s not a newt; it’s an Ensatina. Although they look very much like newts, they’re members of a different salamander family. Ensatinas spend most of their lives in burrows or under rotting logs and leaf litter. They come out at night or when it’s wet; they need to stay very moist and will quickly die if dehydrated. If they succeed in avoiding predators and other hazards like cars, horses, and bikes, species accounts say that ensatinas can live up to 15 years. Like some lizards, ensatinas can drop their tails to distract a predator while they escape (with everything that’s not a tail). Along with many people, predators are often fooled by the resemblance of non-toxic ensatinas to highly-toxic newts. The predators (jays, raccoons, etc.) 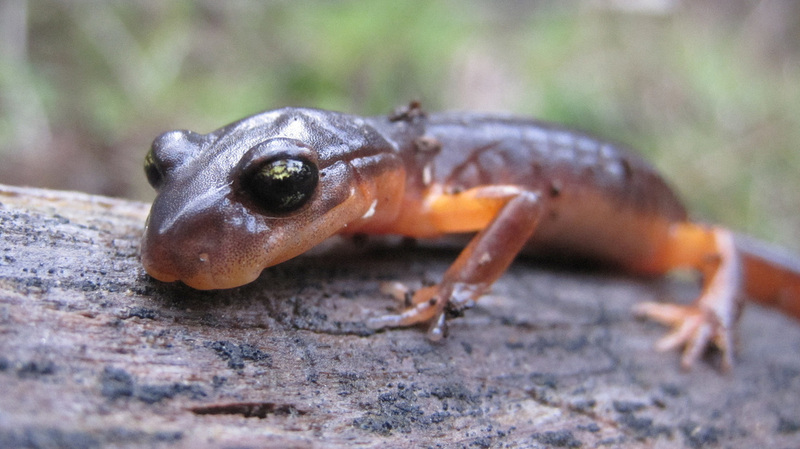 will avoid both the newts and newt look-alikes, so natural selection seems to favor the ensatinas that resemble newts when they inhabit the same range. (That’s another example of mimicry. Remember the bees and the flies-that-look-like-bees?) 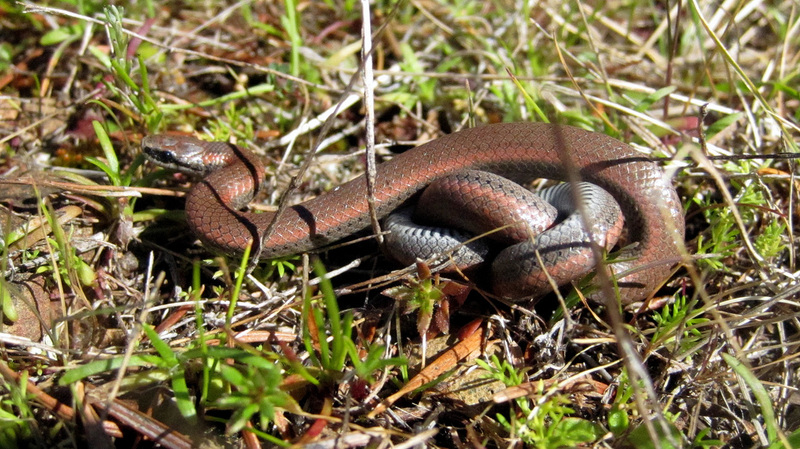 On the other hand, GARTER SNAKES are immune to the toxic bacteria in newts and cheerfully eat both newts and ensatinas. I found this ensatina under a rotting log near Rifle Camp on my bike ride this morning. It was a cooperative photo subject for about one minute, and then suddenly took off at high speed – more like “lizard speed” then “salamander speed” -- for cover under the log.